Having a cutting-edge business solution is one thing; getting it recognized is another. A company must execute superb event marketing strategies to boost brand awareness, and that requires being an efficient event manager. RainFocus is an event marketing platform that aims to streamline and innovate the event management process. Our system is built around attendee experience and designed to optimize returns on investment (ROI). From the agendas and attendees list to post-event reports and revenues, we guarantee the smooth and seamless handling of your data. Get access to integrated solutions of our platform, and have unified event marketing at your fingertips. Event marketing is the development of exhibits or presentations to promote a service, product, or cause. Hosted online or offline, event marketing activities may involve consumer participation and sponsorships. The chief goal of event marketing is to have your story heard and your enterprise recognized. To earn the trust of prospective clients or customers, companies must effectively relay their mission, vision, and personality. That’s where the need for a strategic event management comes in. RainFocus is the first and only event management platform that primarily focuses on attendee experience. With our scalable and dynamic technology, we revolutionize event planning and transform management to marketing. Whether you’re an exhibitor, academic professional, or a concert promoter, our event marketing strategies will help you attract the attention your event deserves. An event marketing platform lets you manage your data easily. As a planner, you may have to juggle tasks and work around the clock to beat deadlines. However, not everyone can multitask effectively. By performing under pressure and dividing your attention, you risk sacrificing your event’s quality. This is when an event marketing platform comes in handy. Our event marketing system provides tools for every stage of your event’s lifecycle. You no longer have to switch between multiple documents, spreadsheets, or applications to monitor your records. With our online program, you can handle registrations, on-site check-ins, surveys and analytics, sponsorship sales, and performance analysis, all in one place. This experiential program will help your marketing team. An event marketing platform provides you with better insights. Separating actionable information from irrelevant event data can be challenging for planners, especially beginners. However, this skill is essential to generating higher ROI and ensuring the constant improvement of your events. Luckily, an event marketing program can address this. Our event marketing program collects relevant information and lets you visualize the yearly performance of your conference, concerts, or parties. However, the function of our event marketing solution doesn’t end with data consolidation. We also provide scalable and actionable insights that can help you learn the lacking aspects of your events and further enhance them. An event marketing platform offers increased efficiency. Not all events are alike. Each one has its unique requirements and challenges. You may need to use a different organizational workflow for each event, and having an adjustable management solution can make this process much easier. At RainFocus, we don’t take a one-size-fits-all approach to projects. That’s why our event marketing program can be fully customized to the needs of our clients. Using a user-friendly drag-and-drop function, organizers can modify content, registration, and exhibitor workflows on our platform. As a bonus, our automation engine can increase attendee engagement through intelligence. An event marketing platform is a time-saver. With unified event marketing, you can ditch checking multiple sources to view your event’s progress. You can save time, which you can spend on further developing your event marketing strategies. Are you tired of constantly referring to separate reports to monitor your event’s performance? Do you need efficient event marketing solutions to increase your attendees’ satisfaction? Simplify the event planning experience, and practice advanced event marketing at RainFocus! 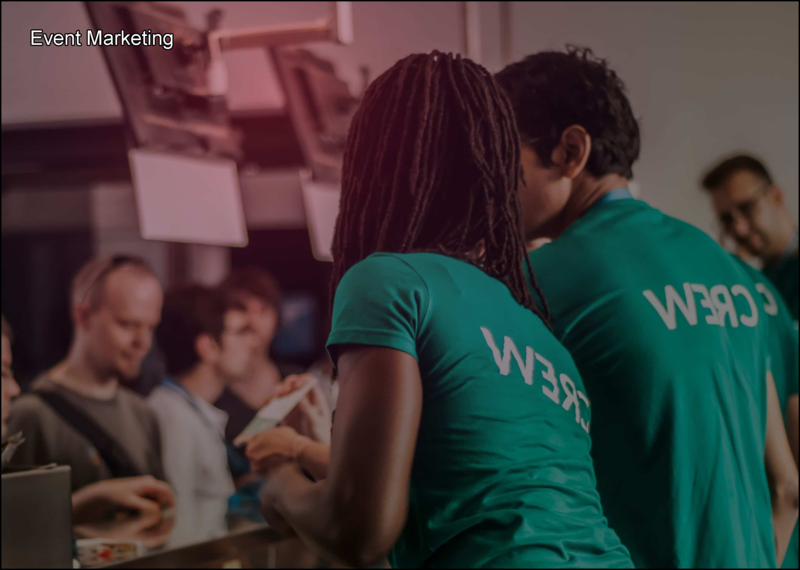 Request a demo of our event marketing platform today. To learn more about our event marketing solution, visit our website. Are you planning to set up an event? RainFocus offers a platform that you can utilize to make the most out of your event. Feel free to call or email us to schedule a demo. You may also visit our website to learn more about our company and our platform. Let us tackle event marketing together.